Neg. 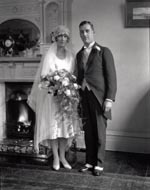 Size: 8½" x 6½"
Subject: The marriage of John Richard D'Oyly to Miss Vera Aimee Cooper, wedding portrait. 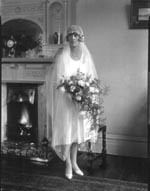 (Bride) Mrs John Richard D'oyly, née Vera Aimee Cooper ( ); only daughter of William Cooper, of 38, Trebovir Road, London; m. (1928) John Richard D'Oyly, of Wellington and of Palmestron North, New Zealand. 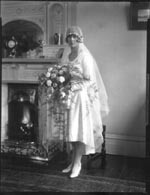 Occasion: The marriage, 2 October 1928, at Holy Trinity, Brompton Road, London, SW.
Biog: [The Daily Telegraph, 4 October 1928, p 1a - the wedding announcement]. Occasion: The Daily Telegraph, 4 October 1928, p 1a.